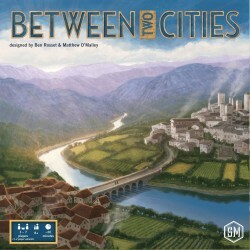 Between Two Cities is a tile-drafting game in whichh each tile os part of a city. You work with the player on your left to buildd one city center whilee simulateaneously working with the player on your right to build a secondd city center. Between Two Cities is a tile-drafting game in whichh each tile os part of a city. You work with the player on your left to buildd one city center whilee simulateaneously working with the player on your right to build a secondd city center. On each turn you select two tiles from your hand, reveal them, then work with your partners to place one of your selected tiles into each of your two cities. At the end of the game, each city is scored for its architecttural grandiosity. Your final score is the lower of the scores of the two cities you helpped design, and the player with the highest final score wins the game. To win, you have to share you attention and your devotion equally Between Two Cities.